Could the election of Donald Trump have unanticipated impacts on the federal tax code’s benefits, which favor homeownership over renting? To the extent that the House, Senate and White House soon will be under one party’s control, the answer may well be yes. Though housing issues got scant attention during the campaign, Trump’s tax reform plans, linked up with versions already proposed on Capitol Hill, could contain some jolts for many people. Late in the campaign, Trump revised his earlier tax plans in ways that make it more compatible with House Republicans’ tax “blueprint” issued this past June. Trump would collapse the current seven tax brackets for individuals to just three: For married joint filers with incomes less than $75,000, the federal marginal tax rate would be 12 percent. For those with incomes of $75,000 but less than $225,000, the rate would be 25 percent. From $225,000 up, the rate for married joint filers would be 33 percent. Single-filer rates would have the same brackets but be based on incomes half the amounts for married joint filers. The capital gains rate would remain capped at 20 percent, and the controversial 3.8 percent “Obamacare” surtax on certain investment income would disappear. There’s no mention here of limits on mortgage interest deductions, so from strictly a homeowner or buyer perspective, nothing jumps out as objectionable. Simplicity is good. In fact, the original Trump tax plan exempted the mortgage interest and charitable deductions from the sorts of modest limitations contained in Hillary Clinton’s proposal. But here’s a key question: With a substantially increased standard deduction of $15,000 to $30,000, how many homeowners will want to file for mortgage interest or property tax write-offs, as many do today. 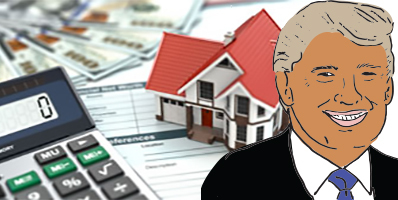 The chief economist of the National Association of Home Builders, Robert Dietz, estimated that the number of itemizers might drop from the current 25 percent of taxpayers to anywhere from just 5 percent to 10 percent. Is that a problem? It depends on how one views the longtime tax code preferences for encouraging ownership of homes over renting. One analysis, provided by Evan M. Liddiard, senior federal tax policy representative for the National Association of Realtors, maintains that if the standard deduction is raised dramatically, “itemized deductions become less relevant,” and previously valuable and distinctive “tax incentives [for] homeownership evaporate even while taxes are not necessarily being reduced.” There’s less incentive to own rather than rent. Dietz put it this way: When you decrease the attractiveness of a longtime subsidy devoted to encouraging purchases by lowering financing costs, “the economics would reduce the tax benefit for homeownership.” Such a change could “increase the after-tax cost of paying the mortgage,” he said. None of this is happening yet. Months of committee hearings and debate — and lobbying — are guaranteed before any tax plan gets to the president’s desk. But it’s an indication of what’s on the line for real estate. Kenneth R. Harney is a syndicated columnist.